As a child flannels were all I knew, once in my teens dabbling with make-up and doing as instructed with make-up removers I used cotton pads but then again I was only removing eye make-up so it did the trick. A year into blogging I read a post regarding microfiber cloths, she said it helped her acne and cleared up her skin, these are mostly found in the household/car sections of stores. The blogger said that it helped to remove all their make-up with just warm water, I tried this but found I needed more than warm water and didn't warm much to the texture on my skin but I did earlier this year decide to try again with the AmazeMitt (review). Microfiber is gentle, reduces the appearance of wrinkles & fine lines, minimise scars, reduce acne, whiteheads and blackheads & clear clogged pores from bacteria & dirt. Suffice to say I don't get on well with microfiber cloths. 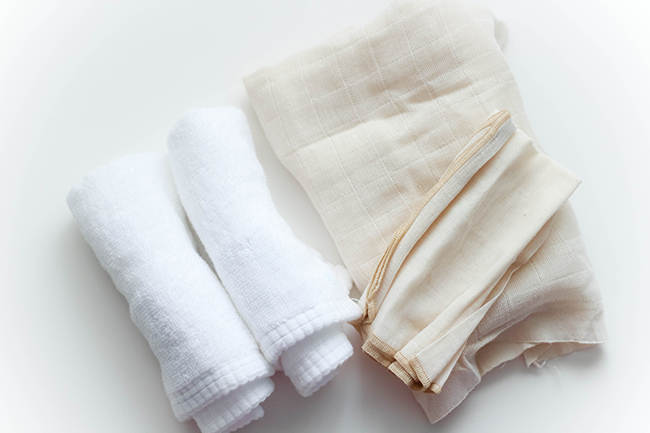 Muslin cloths I was introduced first in 2010 as it was included in the Liz Earle Cleanse & Polish and I was typically converted to using the cloths over the next 3 years. Noticing that there's quite a few different weaving/patterns to the cloths, some a lot softer than others. I like to use muslin cloths around the eyes, it helps to remove the make-up well and it's thinner to work on the lashes and by the tear duct. From last Christmas I have an Dr.Hauschka large muslin cloth that I'm still cutting to this day to use, I find the texture is different to that of the Neal's Yard cloth that is included in the Beauty Balm which is thinner and smoother to touch. Question is what do I get the benefit more out of? Truth be told, both! I use them for different things instead of solely depending on just one. I like to use the flannels on my eyes & face when removing make-up, it's gentler then again I like the muslin cloths (depending on texture) on exfoliating and riding any dryness that maybe occurring as I'm not a daily make-up wearer I do swap and change them around BUT I never use the same one twice. I will put it in the laundry basket ready for it to be washed - hence why I have so many. Just finding what suits you better. Let me know what you use, is it just your hands, microfiber, muslin, flannels - maybe something we are yet to discover..Share!